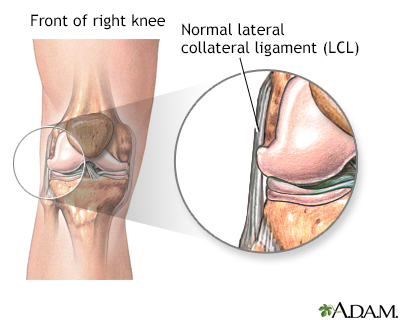 The lateral collateral ligament connects the end of the femur (thigh) to the top of the fibula (the thin bone that runs next to the shin bone). The lateral collateral ligament provides stability against varus stress. Varus stress is described as a pressure applied to the leg that tries to bend the lower leg sideways at the knee, toward the other leg. Activities such as skiing, football and soccer can all lead to this injury.